Interested in reaching Minnesota's veterinary professionals? Why not consider advertising in the MVMA News? 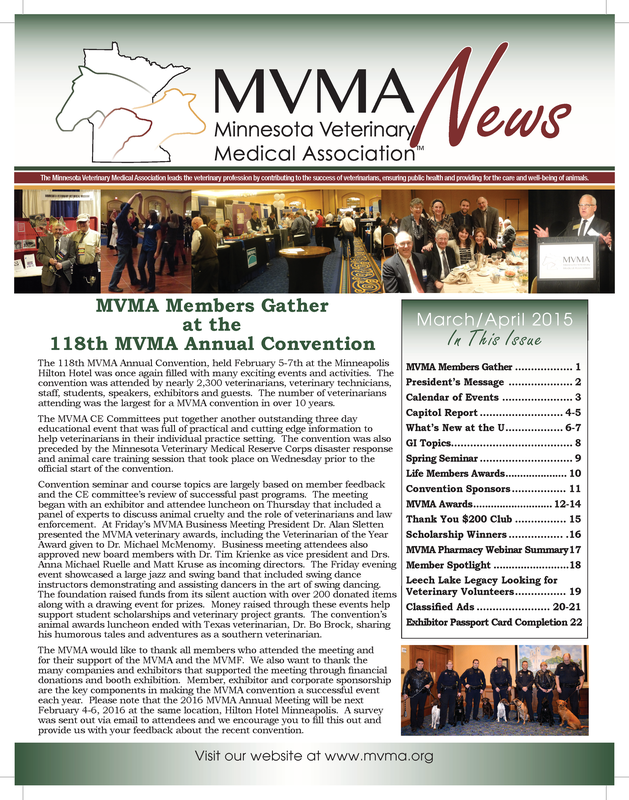 The MVMA newsletter is an informative report of the events and concerns of the MVMA membership and reaches an estimated audience of almost 2,500 readers - veterinarians, technicians, and their family members. Published bi-monthly, the MVMA News includes news and feature stories, providing information affecting the lives, practices, and professional knowledge of MVMA members and their associates. Regular features include columns from the MVMA president, committees, constituent groups, the Capitol Report, as well as upcoming events, member news, CE calendar, and classified ads. The MVMA News is distributed six times a year to our entire membership as a member benefit. MVMA News is distributed the first week of the month of publication. Reservations for space in any specific issue should be made at least four weeks prior to the first day of the month of publication. Display advertisements are accepted on a space availability basis and are subject to approval by the newsletter editor. See below for display advertisement pricing and click the 2019 Display Ad Contract link to complete your contract. complete the 2019 Display Ad Contract. For more information regarding advertising in the MVMA News, display ads, or classified ads, please contact the MVMA.